One of my really good friends jumped on the 'Juul trend' very early on. He constantly raved about it as he puffed out cucumber-mint-smelling smoke. It bothered me because in high school, he was a kid who didn't smoke, didn't drink, and put his health above all. This new craze of electronic cigarettes and vapes have caused teenagers and adults to get hooked on an addiction that is masked by the tagline, "Better than cigarettes." We wanted to do an exploratory data analysis on the current sentiment exemplified by twitter users. 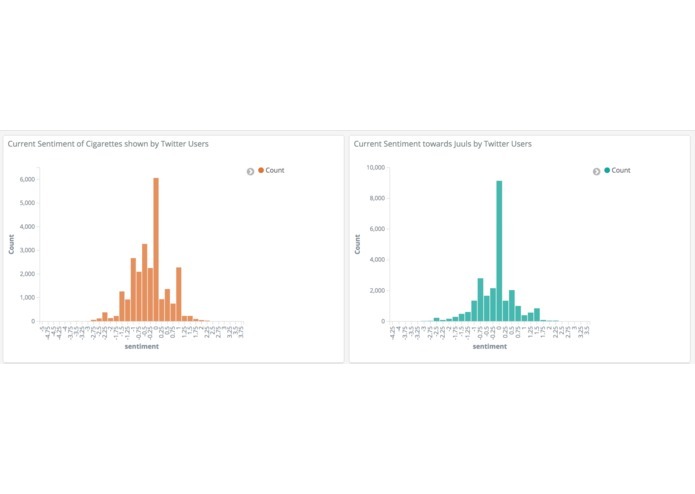 We scraped Twitter's API using R, implemented Elastic Stack to load, analyze, and visualize our data, and hosted all our findings on a web platform. Are the sentiments of cigarettes more negative? Are e-cigarettes the future of smoking? What are the main sentiments associated with 'juuling' versus 'smoking?' That is what we aimed to find out. Our journey to finding an answer was riddled with challenges. At first, we had to know exactly how to scrap Twitter for optimal data. That took up a lot of time in R. Then, our Elastic Stack had major configuration problems. We actually switched laptops 3 different times to start over on the Elastic Stack configuration. Finally, we were able to load in our data and visualize beautifully accurate histograms around 4 AM this morning. It was such a rush from something so simple. The life lessons we learned throughout Ram Hacks 2018 are those of patience, time management, and prioritizing. Our hope is to expand our analysis on other popular trends or fads that may be garnering revenue through the sentiments of the general public. We would love to get more historical data off of sites such as Twitter, Reddit, and YouTube to further our exploratory analysis and make it as accurate as possible.